Happy Monday! I enjoyed my day off by sleeping in, cleaning, going to a doctor’s appointment and making the first real meal in a very long time. For Christmas, my grandma gave me a subscription to Taste of Home. I looked through it over the weekend and found something that caught my eye. Quick, spicy, & enough leftovers for hubs to eat during the week while I’m gone. Although it’s not meatless, it’s still full of vegetables and comes with a cornbread crust 🙂 Overall, it took about 45 minutes to prepare and cook. Not too bad for a week night meal. prepare corn bread batter according to package directions. 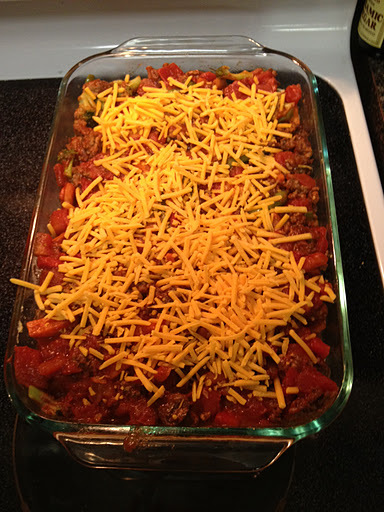 Spread into a greased 11×7 in baking dish. Cook beef in a large skilled over medium heat until meat is no long pink. Drain if necessary. I used really lean beef, so there was not much juice left in the pan. Add tomatoes, vegetables, tomato paste and seasoning. Bring to a boil. Reduce heat; simmer for 5 minutes. Pour on top of the corn bread crust. Sprinkle with cheese. Bake uncovered at 350 degrees for 25-30 minutes. Sprinkle with green onions once the casserole comes out of the oven. “Faith is taking the first step even when you can’t see the whole staircase.” Martin Luther King Jr.